Nina is my kind of heroine…to put it simply, a lover of books. She can match readers to the perfect book for them to read. This is why she makes such a wonderful librarian. Unfortunately, the library she works at in Birmingham, England is closing and a huge corporation is taking over with a media center. A job and place she would definitely not be suited to work. Overall, Nina is a quiet woman who doesn’t take risks. Now, due to necessity, things are changing. She needs a new career and job. To top it all off, her roommate becomes so annoyed with all the books stored in their small apartment, that she asks Nina to find a new place to live. This forces Nina to make even more decisions. Librarians are not in high demand any longer. So, she decides to buy a van and make a bookmobile out of it. The perfect available van to buy is in Scotland. After giving it much thought, she decides to go for it. She buys the van and stays in Scotland. She rides from town to town recommending and selling books. Along the way Nina meets some very interesting people such as an angry landlord and a train conductor willing to help smuggle books to her van. Okay, back to this book. It’s a charming story of a woman who loses everything and is able to pick herself up and start over. That’s really the main point. Not only does she start over, she does it by doing something she loves – recommending and selling books. It’s a heartwarming book with quirky, eccentric and fascinating characters. Each one has a story of their own. I did feel like the book was slow in a couple of spots, but nothing that prevented me from enjoying the book. One thing I found odd is the title. 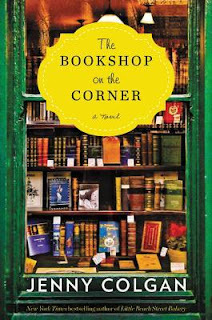 There is no “Bookshop on the Corner”. It’s a bookmobile which travels from town to town. So, that could be misleading. The cover works perfectly with the title, but neither works with the storyline. Not a big deal, but it is noticeable. This is the first book I’ve read by this author. I enjoyed it and am looking forward to reading more books by her. FTC Disclosure: The publicist and Edelweiss provided me with a copy of this book to review. This did not influence my thoughts and opinions in any way. All opinions expressed are my own. That would be a neat thing to do. One of my local library's has a bookmobile that delivers books to your door. As a child, I LOVED going into the bookmobile, which was a rare treat because it didn't arrive very often. This sounds like a fun book, especially for book lovers. I will add a link to your giveaway to my blog's sidebar. Yvonne, what's the deadline for entering this terrific giveaway? I just finished this and reviewed it myself and like you I loved it! I definitely identified with Nina though I did find the title a little odd at first. I think maybe because she parks on corners? Or she's just around the corner? I don't know but it was delightful!